While searching your local fabricator for a granite slab for your kitchen, you may also find discount marble for kitchen countertops. While marble is usually a less expensive option for counters than granite, it is also usually a higher maintenance product. Before you attempt to save money in this way, make sure you get the facts first. Why Are Marble Countertops Less Expensive? Stone counters for your kitchen are a beautiful design choice, but they can also be very expensive. If you're trying to find a counter on sale, you may be tempted with a seemingly less expensive counter of marble. Discount marble for kitchen countertops may seem like a great alternative, it's actually less money for a few reasons. Nearly all granite slab countertops measure 1-1/4 inches in thickness. Marble slabs on the other hand usually measure in at 3/4 inch in thickness. To give the marble the appearance of a thicker edge, your fabricator may recommend that you purchase a built up edge at a higher cost to you. This built up edge is actually epoxied onto the bottom front of your counter, and will have a thin seam bisecting it. Not only is it less durable, it can also be less attractive when not done right. It's rare to find a slab of marble that is as large as a slab of granite. This is because marble is a much softer stone than granite, and is quarried in smaller blocks. While a slab of granite may measure 10 feet long, a slab of marble may only be half that length. What this means for you is more seams in your kitchen counter, or more individual slabs being pieced together for larger kitchens. For wild patterned marbles, this can lead to miss-matched sections or extreme color variation. Marble slabs are smaller and thinner than granite for a reason; the stone itself is softer. This means that it can be easier to extract marble from the quarry than a harder granite block. This savings gets translated into a lower price at the fabricator. Unfortunately for you, that softer stone will mean more maintenance once it's installed. Marble can dull, scratch or mar easily, becoming stained with pizza grease, wine or lemon juice in a matter of months. Knives and kitchen appliances can quickly rob it of its shine, making up for the low cost with the high price of maintenance. If you really love the look and feel of marble, or you just want to take advantage of the lower prices, there are a few stones that will hold up better and give you the best deal for your kitchen. Green marble gets its color from a mineral called serpentine. Serpentine is an extremely hard, scaly mineral that is nearly as tough as granite. A green marble countertop such as Ming Green, Verde Mare or Verde Sultan will stand up to the abuse you give it without losing its shine. Best of all, many green marbles are available in larger, thicker slabs while still being less expensive at the shop. If you want a light colored marble, consider going for one that's not marble at all, but quartzite. Quartzite such as White Thassos or Blue Celeste is much harder and more stain resistant than true marble. These slabs have a sparkling surface and light color that is hard to duplicate. While some quartzites, such as Blue Celeste can be more expensive than other marbles, you can frequently find remnants that make excellent island tops for pennies on the dollar. 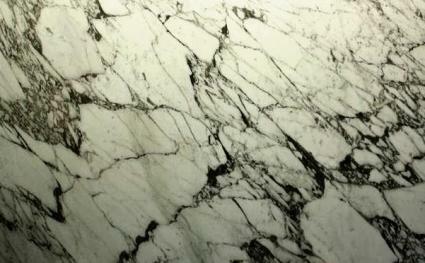 To make sure you are getting the best deal on discount marble for kitchen countertops, talk to your fabricator. Hidden costs like built up edges, or wax treatments to seal the stone can quickly add up, robbing you of your bargain. Ask about the strength of the stone you are considering, and determine if there are a number of slabs from the same lot in case you need more than one to complete the job. Do your homework first whenever you make a purchase, and know that in the end, you are receiving exactly what you bargain for.